At some point, a newfangled gadget in the kitchen becomes a hindrance. Maybe it’s a city thing, where in a small apartment, every inch of storage is at a premium. But it’s also a chef thing. I realized that the basic tools I rely on as a professional cook are, well, basic. There’s very little room—both physically and with relation to speed—for a specialty tool when you can do a task the old-fashioned way. Take, for example, a rubber garlic peeler. This gadget makes me crazy. In the time it would take to get the peeler out of the drawer and get the clove in to it, I could have quickly chopped off the end with my chef’s knife, given the clove a tap with the flat of the blade and voilà, obtained a clean clove of garlic. And I have one less thing to wash and put away. This gizmo culture isn’t new, of course. 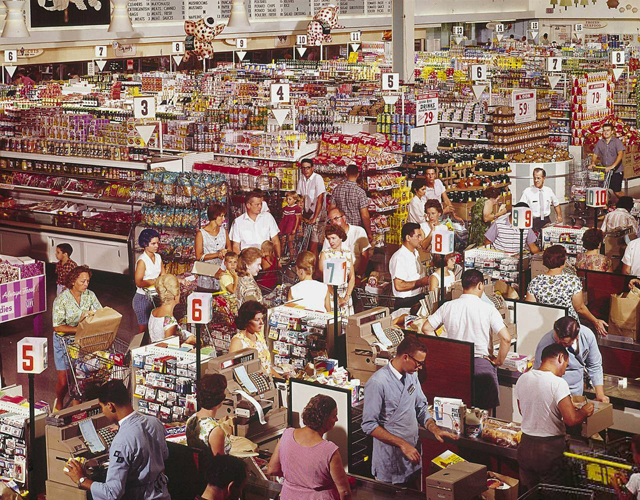 The 1950s might be considered the Internet boom of kitchen convenience products as well as convenience foods. The swingin’ ’70s gave us other things as our mamas brought home the bacon and cooked it up in a pan. According to Richard Snodgrass in his new book, Kitchen Things: An Album of Vintage Utensils and Farm-Kitchen Recipes, adopting convenience products — be they food or funky gadgets for the kitchen — can be an indication of wealth and status. This same thinking is what gave us kitchen inventions (and I use that term loosely) like the Fox Run Butter Spreader or the particularly interesting Peter Petrie Egg Separator . 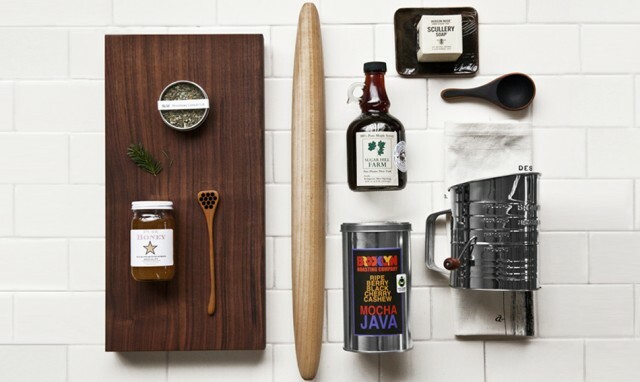 Thankfully, there seems to be a renewed appreciation for traditional kitchen tools that work and also embody the traditions of American craftsmanship. Jacob Bromwell is a classic example. This kitchen-goods company has been doing the same basic thing really, really well for a very long time. 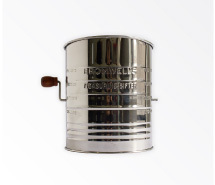 The Pie Safe from Jacob Bromwell is perfect for storing pies, sweets, breads, and other baked goods. Established in 1819 in Cincinnati, Ohio, Jacob Bromwell is the oldest kitchenwares manufacturer, marketer and retailer in the United States. Today, Jacob Bromwell’s specialty products retain that rustic sensibility and high quality the company earned on America’s frontier. Among its patented products are the flour sifters and popcorn poppers you’ve probably seen in your grandmother’s kitchen. All its products, which are made in the U.S.A., are non-electric and have no moving parts. 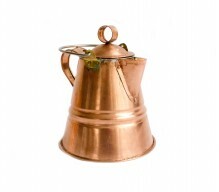 And, to prove that if something ain’t broke, there’s no need to fix it, Jacob Bromwell still uses the same authentic materials it started with nearly 200 years ago, such as tin, stainless steal, aluminum and copper. Have a look at the classic “food processor” by Jacob Bromwell. Similar to a chinois, this tool can do the job of dozens of kitchen aids. Just think: You’ve boiled potatoes to make pommes purée (a more luxurious phrase for mashed potatoes). You can hold the strainer over the sink and pour the potatoes in to let them drain. Then, give the potato pan a rinse, add milk or cream and butter to warm. 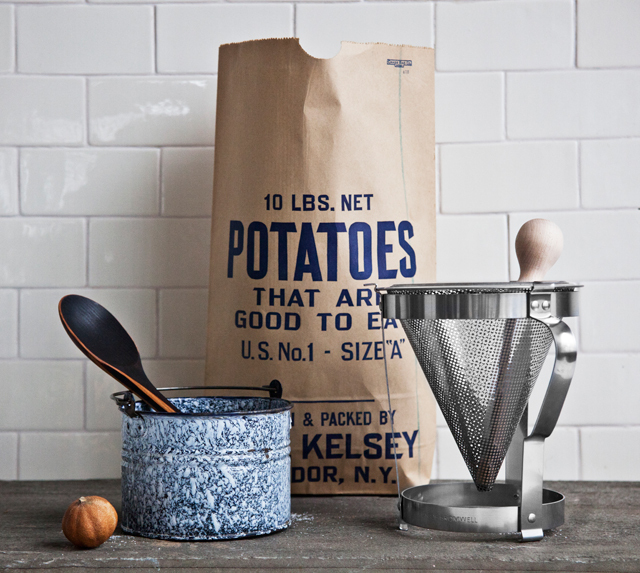 Take your drained potatoes in the strainer to a 9×13 pan and start scraping. The wooden pestle makes quick work of the potatoes, which can then be stirred quickly into the warmed cream for luscious, rich potatoes. 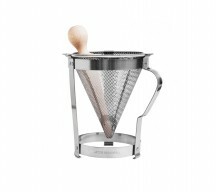 A strainer, drainer and processor? And it cleans easily? Meets my definition of a handy gadget. Lisa McManus, senior editor in charge of equipment testing at Cook’s Illustrated and Cook’s Country magazines and the Gadget Guru on America’s Test Kitchen TV, is a terrific no-nonsense resource about kitchen tools.